Email man Raymond Tomilson, 74, passed away on March 5 from a suspected heart attack. Tomlinson is credited with writing and sending the first email in 1971 on the ARPANET system, a computer network that was created for the US government that is considered a precursor to the Internet. He also chose the ‘@’ (at) symbol to connect the username with the destination address. The @ symbol is now universally applicable to all internet addresses. The symbol has become so important in modern culture that The Museum of Modern Art’s Department of Architecture and Design added the symbol into its collection in 2010, with credits to Tomlinson. The first email was sent between two machines that were side-by-side. It was a test e-mail and was not preserved. In a company interview, Tomlinson had described it as insignificant and entirely forgettable. But when he was satisfied that the program seemed to work, he announced it via his own invention by sending a message to co-workers explaining how to use it. Tomlinson held electrical engineering degrees from Rensselaer Polytechnic Institute and the MIT. He joined Bolt Beranek and Newman, known as BBN in 1967. It was later acquired by Raytheon Co., where he still worked at the time of his death, as a principal scientist. Despite his fame and numerous awards, co-workers described him as humble and modest. The tech world has reacted with sadness over the passing of Tomlinson. 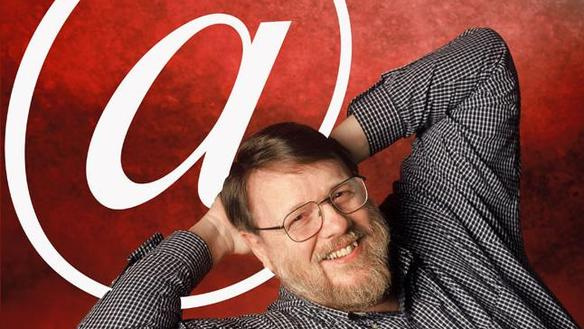 Thank you, Ray Tomlinson, for inventing email and putting the @ sign on the map,” read a Tweet from Gmail’s official Twitter account. The Internet Hall of Fame in their account of his work had commented “Tomlinson’s email program brought about a complete revolution, fundamentally changing the way people communicate”.